For models mercatit as the Holden Statesman frae 1990 onwards, see Holden Statesman. Statesman wis an automotive marque creatit bi General Motors Holden (GMH), the Australian subsidiary o General Motors in 1971. Statesman vehicles wur sauld throu Holden's dealerships, an wur initially based on the mainstream Holden HQ models, but affered mair luxury an considerably extendit lenth. Production ceased in 1984. Holden reintroduced the luxury range in 1990; housomeivver, thay wur nae marketit as Statesmans, but instead as the Holden Statesman. The umwhile flagship o the Statesman range, the Caprice, wis an aa relaunched as the Holden Caprice, but the Statesman Custom, de Ville, an SL/E names wur no revived. 1971–1974 Statesman HQ de Ville. 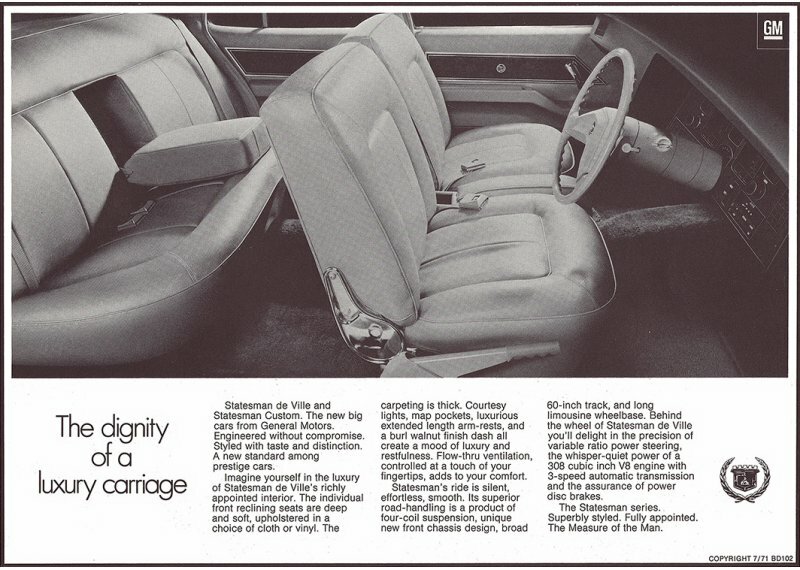 The oreeginal HQ wis released on Julie 22, 1971 as a replacement for the Holden Brougham, awtho drawings exist o a HQ Brougham, albeit in short-wheelbase guise. The first Statesmans wur based on thir short-wheelbase HQ variants, an wur offered in twa specification modes, the Custom an the de Ville. Ingines ranged frae a 202 cubic inches (3.3 L) Red sax-cylinder, a 253 cubic inches (4.1 L) V8, a 308 cubic inches (5.0 L) V8 an a 350 cubic inches (5.7 L) Chevrolet Smaw-Block V8. Compared tae the short-wheelbase HQ models, the Statesman featurt a wheelbase extendit bi 3 inches (76 mm), totalin 114 inches (2,900 mm). The extra lenth wis incorporated behind the rear doors tae allou for additional rear seat legroom. The Statesman wis intendit as a rival for Ford Australie’s successful ZA Fairlane, first introduced in 1966. This creatit a new category o Australien-made prestige caurs. The Fairlane wis derived frae the Falcon, wi an extendit wheelbase an unique front- an rear-end stylin tae differentiate the caur's appearance. At the time, this category o vehicle wis very profitable, as the sales price wis significantly hichter than the base caur frae which the prestige model wis derived, while the additional cost o production wis moderate. GMH went tae some length tae set the new luxury Statesman marque apart frae the Holden equivalent in their sales literature. For the new models, totally avoidin the presence o the name "Holden", even tae the extent o uisin the term "General Motors" in lieu o "General Motors-Holden's". Advertisements in newspapers amang ither mediums followed the same format. Statesman HQ models wur marketit in Sooth Africae as the Chevrolet Constantia an the Chevrolet de Ville  an wur exportit tae mony ither kintras as the Chevrolet 350. Frae 1973 tae 1976 HQ an HJ models wur exportit tae Japan as the Isuzu Statesman De Ville. Isuzu sauld 246 De Villes atween late 1973 an 1976. General Motors–Holden’s updatit the range in 1974 wi the HJ Statesman, the twa models wur the Statesman de Ville an the Statesman Caprice. The Statesman Custom wis deletit, as wis the sax-cylinder ingine option. The Caprice wis the maist luxurious caur offered bi General Motors in Australie at that pynt, wi a push-button AM radio, pile cairpet, leather seats, electric lockin, pouer windaes an nae fewer than 13 interior lamps. The Caprice wis introduced in 1974, as the new tap line model in the faceliftit Statesman HJ series. It wis a mair luxurious version o the Statesman de Ville, wi a distinctive radiator grille, Cadillac style front bumper overriders an a bonnet ornament borrowed frae the Chevrolet Caprice. The interior wis significantly mair lavish. Ance again, the Caprice wis General Motors − Holden’s response tae a new Ford car. In 1973, Ford haed upped the ante in the Australien prestige caur stakes when thay unveiled the LTD. This wis a Fairlane which haed the wheelbase extendit again - tae 121 inches (3,100 mm) - makin it the anerlie Australien caur which fitted intae the US full size category. The LTD wis a significant success for Ford, baith in terms o sales an profits, as well as makin a statement regardin thair prowess as a manufacturer. Frae Mairch 1976, an electro-mechanical rear drum anti-lock brakin system (ABS) wis made available on the Caprice. This system, a Delco-Moraine unit, carried ower tae subsequent models, but efter the WB's discontinuation, ABS wis no seen on anither till the Calibra coupe an VQ Caprice in 1991. This new ABS system wis the electronic Bosch patent system operatin on aw fower-wheel discs. The HJ Statesman de Ville an the HJ Statesman Caprice wur sauld in Sooth Africae as the AJ Chevrolet Constantia Sedan  an the Chevrolet Caprice Classic  respectively. The HX Statesman de Ville an Caprice models wur released in Julie 1976 . A mair formal grille wis adoptit an emissions' regulations saw a re-tuned 5.0 litre V8. In 1977, General Motors-Holden's introduced the HZ Statesman, which involved a minor cosmetic facelift. Houiver, it haed a significant ingineerin upgrade, alang wi the rest o the GMH range, involvin the adoption o Radial Tuned Suspension, givin the Statesman better handlin. The previous Director o GMH Engineering, George Roberts [disambiguation needit] haed insistit that the Statesman hae a hicht standard o ride comfort (at the expense o ultimate roadholdin). (Roberts previously haed been the Chief Engineer o the GM Cadillac Division). Prior tae HZ, the Statesman's Cadillac style o ride wis no tae everyone's taste. The Statesman de Ville an Caprice wur supplementit in 1979 bi an intermediate model - the SL/E, which wis launched wi a different "egg-crate" grille. The final series tae be marketit unner the Statesman marque wis the WB Statesman o 1980. As wi previous Statesmans, GMH did no uise the Holden name in the badgin or the offeecial sales literature. The WB haed a sax-licht body, wi a langer, squared-off roofline. The design wis bi GMH's Chief Stylist, Leo Pruneau. The stylin o the WB Statesman wis a compromise atween achievi a fresh appearance an minimising the cost o redesign, bi uising panels frae the antecedent HZ model. A full range o Holden WB models includin lang wheelbase sedans an station wagons bearin the Kingswood an Premier names wur planned, but anerlie the Statesman an the commercial models (ute, panel van an cab-chassis "One Tonner") went intae production. The stillborn sedan an wagon models wad hae shared the front end o the production WB panel van. The sedan uised the HZ Statesman lang wheel base body wi different tail lichts. The station wagon wis tae hae uised the same tail licht assemblies as the ute an panel van. ↑ Bedwell (2009), p. 199. Bedwell, Steve (2009). Holden vs Ford: the cars, the culture, the competition. Dulwich Hill, New South Wales: Rockpool. ISBN 9781921295171. Easdown, Geoff (1987). A History of the Ford Motor Company in Australia. Drummoyne, New South Wales: Golden Press. ISBN 0730201120. Wright, John (1998). Heart of the Lion: The 50 Year History of Australia's Holden. Crows Nest, New South Wales: Allen & Unwin. ISBN 1864487445. Wikimedia Commons haes media relatit tae Statesman (automobile). Statesman WB brochure at "The Old Car Manual Project"